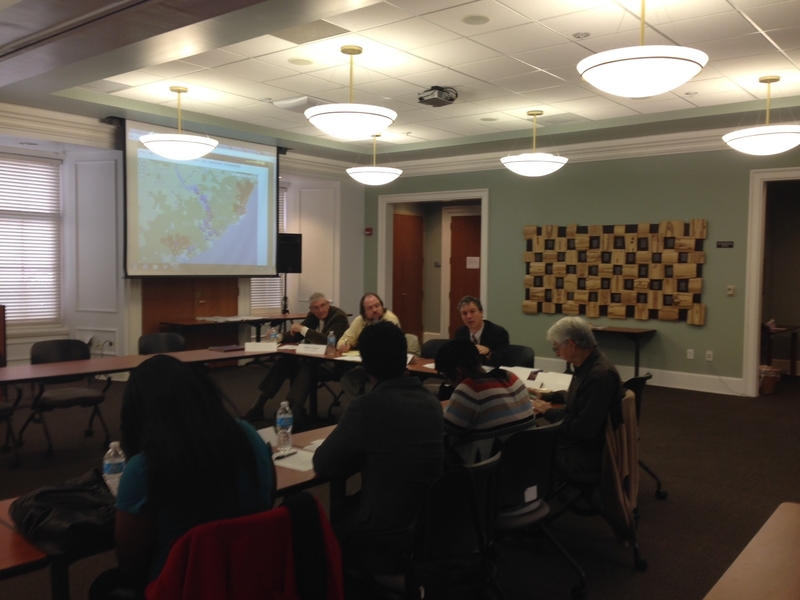 Jubilee Project wrap-up discussion, College of Charleston, November 19th, 2013. Pictured (facing camera, left to right): Richard Ogden, Mike Coker, and Simon Lewis; (with backs to camera, from right to left): Jack Bass, Deni Mitchell, Jonathan Green, and Aurora Harris. On the screen is a map of South Carolina showing all the former rice plantations — http://www.ricekingdom.com/plantationmap.html. On November 19th, the anniversary of the Gettysburg Address in 1863, a small gathering of Jubilee Project stalwarts met at the College of Charleston to discuss where we have been and where we go next. Emerging from our discussions, we have decided that next semester, Margaret Mauk will put together a physical scrap-book along with a digital version to record as fully as possible the key events of our Year of Jubilee. If you have physical artifacts–invitations, programs, flyers, newspaper clippings, etc. –that you would like us to include in the scrapbook, please send them to me as soon as possible c/o the Department of English, College of Charleston, 66 George Street, Charleston, SC 29424-0001. Likewise, if you would like to write a report or a review of any of the events that made up the Jubilee Project, or if you would like to write a reflection on the Project, please send those to me via e-mail at lewiss@cofc.edu. We will offer the physical scrapbook to the Special Collections department of the Addlestone Library for safe-keeping and for use by future researchers, and hope to have the digital version accepted by the Low Country Digital Library. During the meeting on the 19th, I referred to a planning charrette held back in 2007, and pointed out that many of the goals identified by that charrette to overcome the acknowledgment gap that exists between public recognition of white and black contributions to local history have been achieved, at least in part. Aurora Harris’s stellar work with the Preservation Society , for instance, made major contributions to publicly acknowledging African American contributions to area history. But there is much more to be done. As such, we decided that one way the Jubilee Project could remain effective beyond this year of multiple anniversaries would be as a kind of clearing-house for all kinds of events to do with emancipation and educational access. Accordingly, I invite you all to keep on sending me details of any events that might be in the spirit of the Jubilee Project in the coming months and years. I will attempt to maintain a calendar on this blog-site and will continue to make postings to the Facebook page. Finally, please be on the look-out for a number of ambitious events coming up in the future: the 2015 commemoration of the end of the Civil War (May 1st, 2015? ); a major conference on slave port cities and public memory (March 2016); and a conference on South Carolina’s Reconstruction Constitution (March 2018). In the meantime, if you’re in Charleston this New Year, please do consider attending one of the many Watch Night services, and join us for the annual Emancipation Day Parade. Thank you all for your support over the last year and for your participation in the Jubilee Project. College of Charleston English Professor Simon Lewis saw Nelson Mandela in 1990 and calls it a most extraordinary experience. Lewis spent his teenage years in South Africa during apartheid and recalls the legendary 1994 election, and how these experiences impacted the course of his life. Tanzania was the first country Nelson Mandela visited after being released from prison in 1990. Simon Lewis was living in the country at the time teaching at an international school, and he and his wife were among the thousands that lined the route from the airport to the Government House in downtown Dar es Salaam. Lewis was the editor of Illuminations: An International Magazine of Contemporary Writing. The 1989 and 1990 issues were devoted to South African writing and the difference between the two issues was remarkable Lewis recalls. The 1989 volume was full of anti-apartheid poetry and protest prose, then after Mandela was released from prison in 1990, the following Illuminations volume contained ecstatic poems – a true reflection of the feelings in that part of the world. Lewis was last in South Africa three years ago, but has been watching and reading all he can in the past few days. He predicts that the politics there will shift from a racial focus to a focus on social and economic issues. 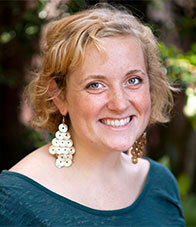 Simon Lewis can be reached at lewiss@cofc.edu or 843.953.1920. Salaam wa Lakum! I’m Kristen Young, a graduating student from the College of Charleston Master of Public Administration (MPA) program, as well as the co-founder of a non-profit in Morocco. I am happy to share with you some information about travel, research, and working in Africa. Having spent the summer working there, I’ve got some advice for those of you who want to pursue study abroad research and work possibilities. To improve the lives of Moroccan youth and the development of the Ouaouizerth community by facilitating peer-to-peer educational pathways in basic health, job training, and women’s empowerment. CCDM has now grown to a 7-member board comprising both Moroccans and Americans. We approach learning as a partnership and recognize the importance of fostering global alliances. We have hosted three American graduate students as interns in development, and recently acquired a grant from the Kingdom of Morocco (in partnership with another local organization called Amzawro Association for Development) for seven teachers’ salaries. We also recently purchased ten computers, hundreds of books, and a projector for our classrooms. And through the computer learning, job training, and women’s literacy classes offered we have been able to reach over 200 local residents to date. For my graduate research, I appropriately decided to focus on strategic recommendations for Moroccan non-profits to identify the best methods for implementing projects with CCDM. I spent the summer doing research there courtesy of grants from the College and other sources, and subsequently won the Robert L. Kline award for most outstanding student paper in the Southeast region for Public Administration. You can do stuff like this, too! There is no limit to the things you can accomplish through the College of Charleston. If you have a great idea for research or travel, or if you just know you want to have a meaningful experience, the College has a range of research opportunities available through the International Studies department and the African Studies department, as well as travel and volunteer opportunities through the Center for International Education. I started out by creating a poster outlining my research goals for the competitive College of Charleston Graduate Student Poster Session, which awards small grants for students to pursue their research. I didn’t win, but it was great practice—in talking about my organization and ideas for research, getting ideas from other people, and shaping the future of my study. More importantly, it was an introduction to all the hard work I would be doing to make my dream a reality. I cannot stress enough the importance of hard work and dedication to a venture like this. Going the “extra mile” by being involved in things like conferences and poster sessions could make or break an application for funding, or to graduate school, or for an international experience. Be involved, knowledgeable, and strong. Know yourself and your goals, because you will be advertising both! The College of Charleston has a wealth of resources for students who want to do research, volunteer, or work internationally. Ask for help from everywhere, and listen to people when they give you advice! Go to your faculty adviser, or seek help from other people who have traveled abroad. Make new friends. Seek out all opportunities and then apply for them. Don’t get discouraged when you don’t get funding, or get less than you wanted. Odds are, if you work really hard and believe in yourself and your goals, other people will too! For more information about how you can get involved in learning adventures like this, contact the International Studies (http://internationalstudies.cofc.edu) or African Studies (www.cofc.edu/~africanstudies) departments. For information on international funding, contact your program office, or the Center for International Education (https://international.cofc.edu); for larger long-term study grants, check out the Office of Nationally Competitive Awards (http://nationalawards.cofc.edu). The possibilities are limitless! You can learn more about my organization CCDM at: www.ccdmorocco.com or contact me at youngkn@g.cofc.edu. Shukran bisef (thank you)! Those present also recognized the 36th birthday of the Nu Zeta Chapter: on November 21, 1977, the College of Charleston’s chapter was founded by Professor Fleming G. Vinson, Associate Professor of Spanish and Italian, with the initiation of four charter members.